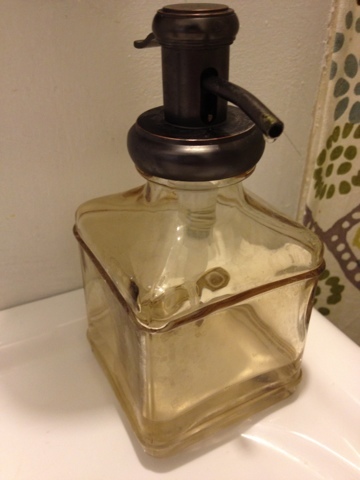 A couple of weeks ago, I noticed that our soap dispenser is low on soap and we’re out of refill. A light bulb went off and I thought maybe I can make liquid hand soap. 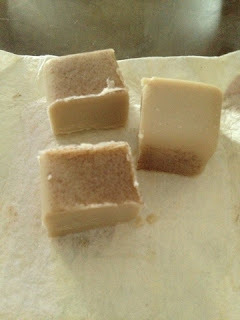 Last week, I started googling for soap making directions. 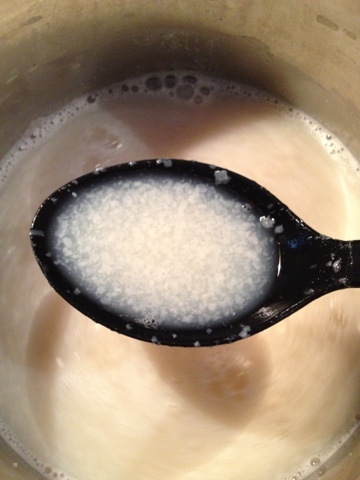 The first few search results were how to make liquid hand soap from bar soap. 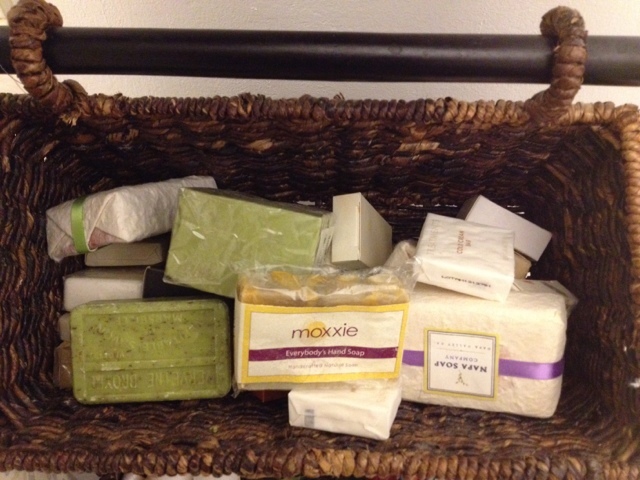 That was just perfect because KT and I love to collect bar soaps. 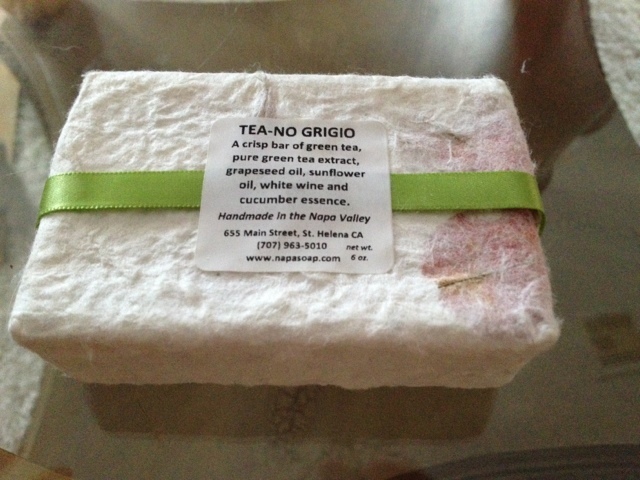 We especially love the handmade bar soaps that we find at local shops and farmers markets whenever we travel. They smell so so good. 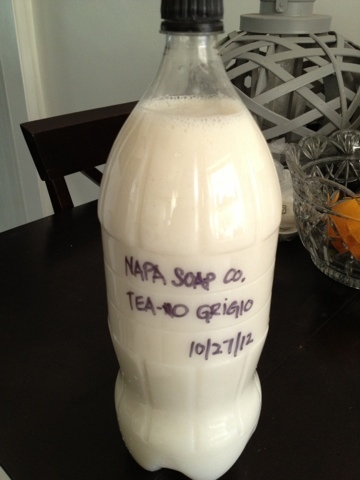 That translates to a nice stash of bar soaps I can use to make liquid hand soap. I read through a few website/blogs for how-to directions and my favorites are the Better Mom, Savvy Housekeeping, and wikiHow. If you click through those links, you’ll noticed that the ratio of ingredients are very different from site to site. My conclusion is that it really all comes down to the type of bar soap you use. 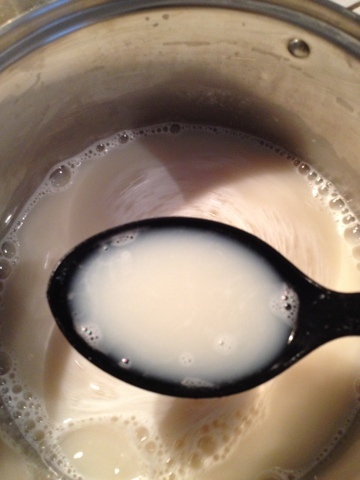 (From reading through a lot of sites and comments – the biggest problem is making liquid soap from Dove bars. So if you REALLY want to use Dove bars, you should probably use these directions). 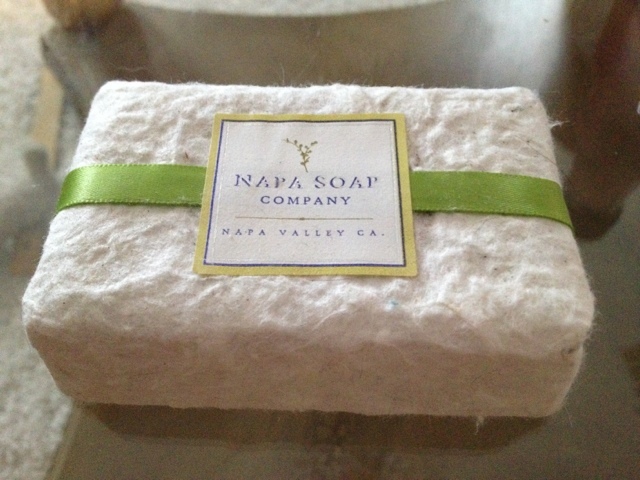 I decided to use a 6 oz bar from Napa Soap Company. Here are the ingredients on the back. 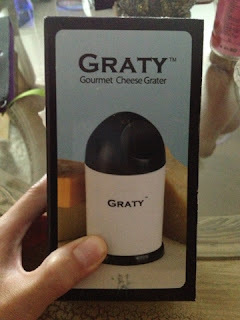 I got this As Seen on TV Graty for Christmas one year. Since I don’t eat cheese or grate anything else, this has been sitting in the box for a while. I’m so glad I finally found a use for it. I had to cut up the soap into one inch cubes so they would fit in the grater. I added about 5 cups of water. Since I really don’t know how much water I need for this particular bar of soap, I decided to start out with just enough water to melt the soap shavings. 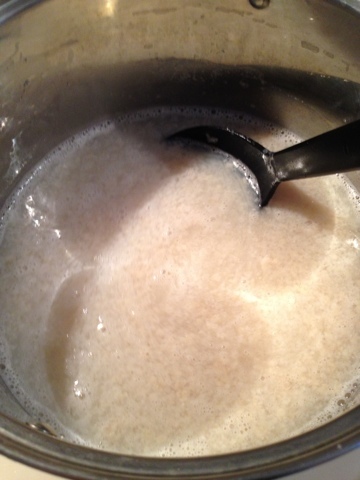 I figure I can add more water as it thickens. It melted in less than five minutes over medium heat. Again, I figure I can add more later if needed. We already had this from when KT made me a snow globe last Christmas. 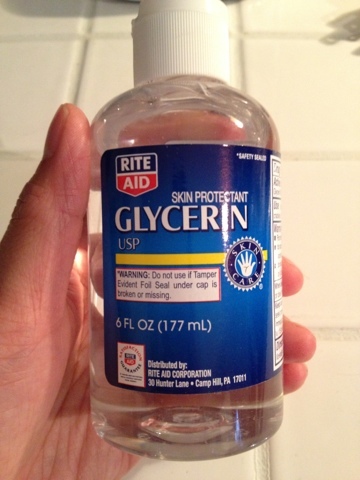 KT wanted to point out that liquid glycerin was quite difficult to find. He had to go to several drug stores to find it. I added four more cups of water. 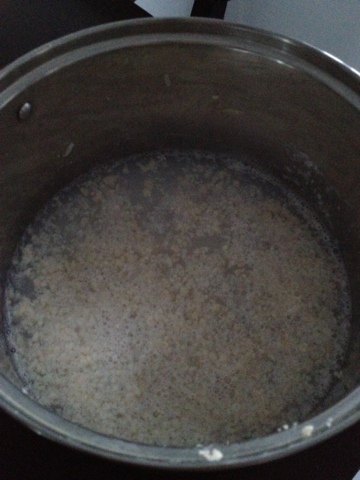 It hasn’t thicken yet but I figured I should be safe with a minimum of ten cups of water and I’m only at nine cups. The consistency is very watery but smooth. 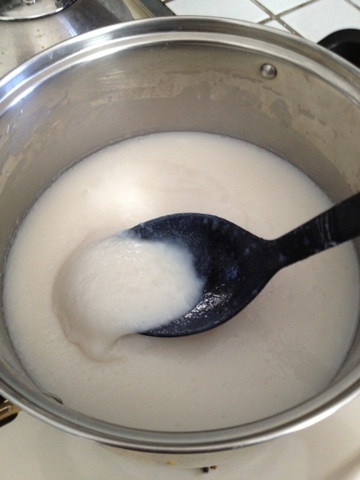 The melted soap, water, and glycerin are mixed very well. It started noticeably thickening after six hours. It looks like this picture below the next morning, after 15 hours. KT tested it for me while I take some pictures. KT just so happened to finish off a two-liter bottle coke and it perfectly holds a little less than 9 cups of liquid soap (taking into account evaporation). Glad I came across this link going to try the recipe for Dove to see if it will work any better. 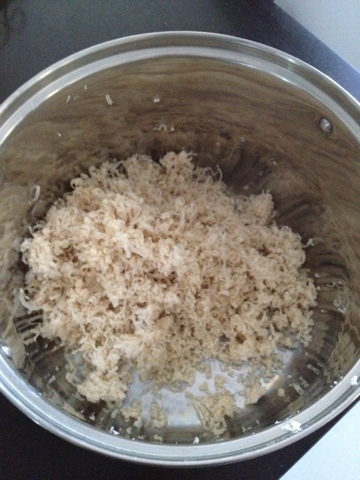 This is what I did to make mine and it’s like water.I used a bar of Dove soap. 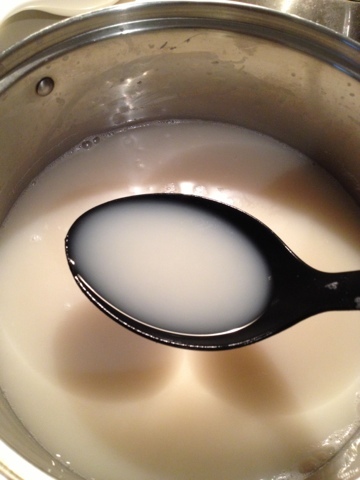 Turn on medium-low heat and stir until the soap dissolves.Let the soap cool completely, then pour into containers using a funnel and that’s it well that sure wasn’t it :). So maybe the recipe you gave on Dove will come out thicker then the one I made. did it turn slimy or snot like later? I tried doing this with lux bars a few times and ended with really thick, gloop type thing that solidified so much that i couldn’t get it out of the bottle i put it in and yes I used about 10 cups water to 2 bars of soap. The smell vanished too later on after heating. Did that happen with your soap?